In his 3rd year's State of the Nation Address (SONA), Pres. Rodrigo Duterte surprised the public for delivering a speech that is unusual compared to his previous SONA speeches. The reason being is that the recent one is shorter. What made the president's speech more different this time is that, he delivered the speech that was free from cursing. With some reports saying that the 14-page speech was originally planned to be finished around 30 to 40 minutes, the Mindanaon President completed the powerful speech closed to the expected time mentioned: almost 50 minutes. Started at around 5:20 PM, the SONA ended at 6:10 PM. According to a report, he garnered 32 rounds of applause from the audience in the Bernal-directed SONA. 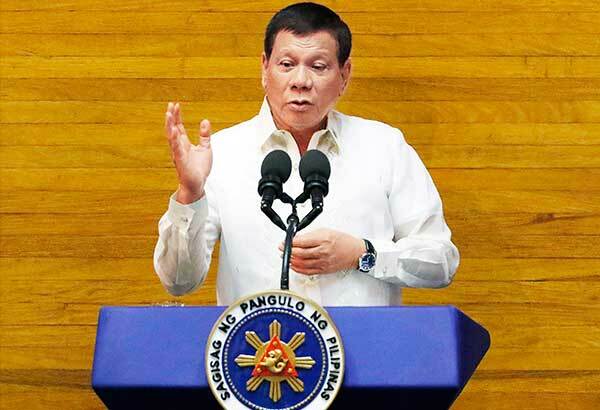 The fierce president earned praise from his expletive-free speech that focused not on his administration's achievements as according to him, it would be self-absorbed, but rather, on his future plans for the country and the years to come. Let me begin by putting it bluntly: the war against illegal dr*gs is far from over. Where before, the war resulted in the seizure of illegal dr*gs worth millions of pesos, today, they run [into] billions in peso value. I can only shudder at the harm that those dr*gs could have caused had they reached the streets of every province, city, municipality, barangay and community throughout the country. This is why the illegal dr*gs war will not be sidelined. Instead, it will be as relentless and chilling, if you will, as on the day it began. These dr*g dealers know fully well that their business is against the law. They know the consequences of their criminal acts, especially when caught in flagrante delicto and they violently resist arrest. They know that illegal dr*gs waste away lives, dysfunctionalize families, and ruin relationships. They know that once hooked, addicts will die slowly --- slow deaths. And yet, they persist in doing what they do, oblivious to the terrible harm that they cause to the people and communities. And when illegal dr*g operations turn nasty and bloody, advocates of human rights lash at—and pillory—our law enforcers and this administration to no end. Sadly, I have yet to hear really howls of protest from the human rights advocates and church leaders against dr*g-lordism, dr*g dealing and dr*g pushing as forceful and vociferous as the ones directed against the alleged errant [law] enforcers in the fight against this social scourge. While we run after those who steal the people’s money, we are also enhancing the government’s delivery of frontline services. I thank Congress for the swift passage of the Ease of Doing Business [Act], [applause] which is a significant fight against corruption and improving service delivery. We need to sustain our momentum. And I hereby direct all [local] government units --- makinig sana kayo --- and government agencies to faithfully implement this law and simply simplify the process. Hinihingi ko ho ‘yan sa lahat nasa gobyerno under my control and supervision. Huwag ho kayong magkamali. I particularly call the attention of the agencies with the [most] number of red tape-related reports from the public, make your services truly customer-friendly. Our people deserve efficient, effective, and responsive government services. They deserve nothing less. [applause] Kayo lang ang ayaw eh. Gusto ng tao kayo ‘yung binabayaran, make your living from the pockets of the people, and you have a lousy and corrupt bureaucracy. This is a lonely place I am hemmed in. Do not make it lonelier by forcing me to end our friendship because you gave me the reason to end it. It pains me to end --- the loss of friendships. And that is why I appeal to you to help me in my cause so that our friendship will endure. We aim to rectify that derisive observation and, as a matter of fact, we are now in the process of fulfilling that promise through significant increases in the budget for Mindanao. At the end of my term, I hope to see the promise of Mindanao fulfilled, or at the very least, approaching fulfillment. When the approved version is transmitted and received by my office… The law has been passed actually and I intend to… Give me 48 hours to sign it and ratify the law. [applause] Babasahin ko pa bago ko pipirmahan. Baka may isiningit kayo diyan na hindi maganda para sa --- para sa ibang tao. On international relations, we shall continue to assert and pursue an independent foreign policy. Our long-term national development and national security goals come first. We shall continue to reach out to all nations regardless of their prevailing political persuasions or proximity to or distance from our shores so long as these nations wish us well. Our re-energized relations with China has also led to an unprecedented level of cooperation between our nations on the war against transnational crimes. Our shared intelligence led to the discovery and dismantling of the clandestine shabu laboratories and the arrest of Chinese chemists [connected] with the Dragon organization called Wu Syndicate. Our improved relationship with China, however, does not mean that we will waver in our commitment to defend our interests in the West Philippine Sea. [applause] This is why we engage China through bilateral and multilateral platforms such as the ASEAN-China and the PhilippinesChina Bilateral Consultation Mechanism. Opening lines of communication and amicably managing differences have led to positive developments that include renewed access of Filipino fishermen in the areas in dispute in the Philippines --- West Philippine Sea. Participation in the ASEAN-China dialogue has also resulted to the draft framework for the Code of Conduct in the South China Sea which intends to resolve disputes by peaceful means. This is just [the beginning]. For the other tourist destinations needing urgent rehabilitation and enforcement of environmental and other laws shall soon follow. I urge our local government units to proactively enforce our laws and not wait for us to swoop down on your areas just to do your duty and work. [applause] At some other time, I would have to discuss sa local government units. Hence, we, in the Cabinet, have approved for immediate endorsement to Congress the passage of a law creating the “Department of Disaster Management,”[applause] an inter-agency --- just like FEMA. Well, I don’t know if it’s --- it’s an effective agency in the United’s government. An inter-agency crafted and a high-priority measure aimed at genuinely strengthening our country’s capacity for [resilience] to natural disasters. I fervently appeal to Congress to pass this bill with utmost urgency. Our people’s safety requirements cannot wait. Ours is a rich and beautiful country, indeed. Add to that a great number of people equipped with technical expertise and professionalism, and you have a country poised to soar and take its place among the world’s economic and financial eagles. God willing. Inshallah. Again, I warn irresponsible miners, along with their patrons, to stop destroying our watersheds, recharge areas, forests, and aquatic resources. You can no longer fish in our rivers. It’s all contaminated. And the color is not even brown or white, it’s black. You want to see it? I will invite you. We can go to Diwalwal and the other mining areas. And I’m sure you will puke with what is happening to this country. Expect reforms, radical ones. I do not intend to quarrel with anybody, with the moneyed, but for as long as I am here I said: you will just have to contend with me. I exhort all concerned agencies and local government units to uphold the concept of intergenerational responsibility in [the exploration] and utilization of our mineral wealth, the protection and preservation of our biodiversity, anchored on the right to a balanced and healthy ecology. One of the most important thrusts of this administration's medium-term development plan is to cover all Filipinos against financial health risks. That is why I have directed concerned agencies to streamline the various sources of financial assistance for people with health-related needs. We are currently institutionalizing the unified implementation of the "No Balance Billing Policy" [applause] through which the government and our private healthcare providers can work out a system that will provide an order of charging of medical expenses. These will ensure that every Filipino [family] gets the appropriate, affordable, and quality health services in appropriate facilities and will be protected from financial burden due to sickness. Four administrations before me have tried to amend the Constitution to be able to introduce amendments and reservations to the charter --- revisions rather to the charter. But none of them has successfully done for one reason or another. I am confident that the Filipino people will stand behind us as we introduce this new fundamental law that will not only strengthen our democratic institutions, but will also create an environment where every Filipino—regardless of social status, religion, or ideology—will have an equal opportunity to grow and create a future that he or she can proudly bequeath to the succeeding generations. My countrymen, I will not bore you with a litany of this administration’s projects completed otherwise in the process. That would be too self-serving. I have instead caused to be prepared a written report on what has --- what was and what has been done in the months and probably in the years to come. The reports shall be made available within the next few days. In ending, may I quote --- I have always quoted but --- in my previous talks. One American that I salute, the great Abraham Lincoln. And this has been --- I’ve been in government for the last… If I completed my… If I complete my term, Inshallah, God willing, I would have served government for 40 years. And I came across this statement which has been with me since I was a fiscal in the 70s. And he said: If I were to try to read, much less answer, all the attacks made on me, this shop, the presidency, might as well be closed for any other business. I do the very best I know how—the very best I can; and I mean to keep doing so until the end. If the end brings me out all right, what is --- what has been said against me won’t amount to anything. But if the end brings me out wrong, ten angels of God swearing that I was right would make no difference.